D.L. Geary's Brewing Company, the oldest brewery in Maine, opened a new tasting room last week, embracing the public's growing interest in craft beer. Located in Portland's industrial Riverside neighborhood, Geary's brewery neighbors the Allagash Brewing Company complex and the "beer incubator" that houses Bissell Brothers Brewing, Foundation Brewing, and Austin Street Brewing. Before the small tasting room was roughed out of the industrial brewing space, Geary's offered tours daily, but there was no retail space in which to relax and enjoy a sampling of their beers. Of course, breweries are working spaces, with things to trip over, slip on, get your fingers caught in, etc., so Geary's tours were previously limited in size and scope. While some would like to venture into the brewing space and hear about specific gravity and malt profiles, others would rather simply pull up a stool and sip on a few brews. 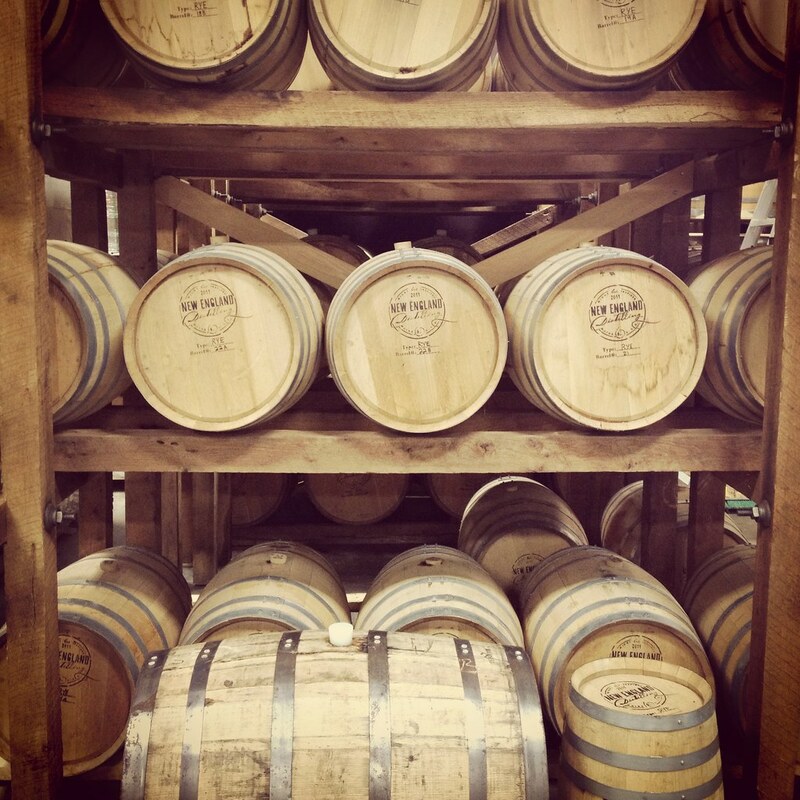 The new tasting room and continued tours will allow you to do both! During the grand opening, the staff at the tasting room was pouring 6 beers, and I sampled the Autumn, a brown ale; the London Porter; and the cask-conditioned Hampshire Ale. I enjoyed the gentle, malty flavors of Geary's beers, but then was grateful to have the Maine Brew Bus as a shuttle to get home! The 7% ABV Hampshire Ale began to catch up with me by the time the shuttle was due to leave. 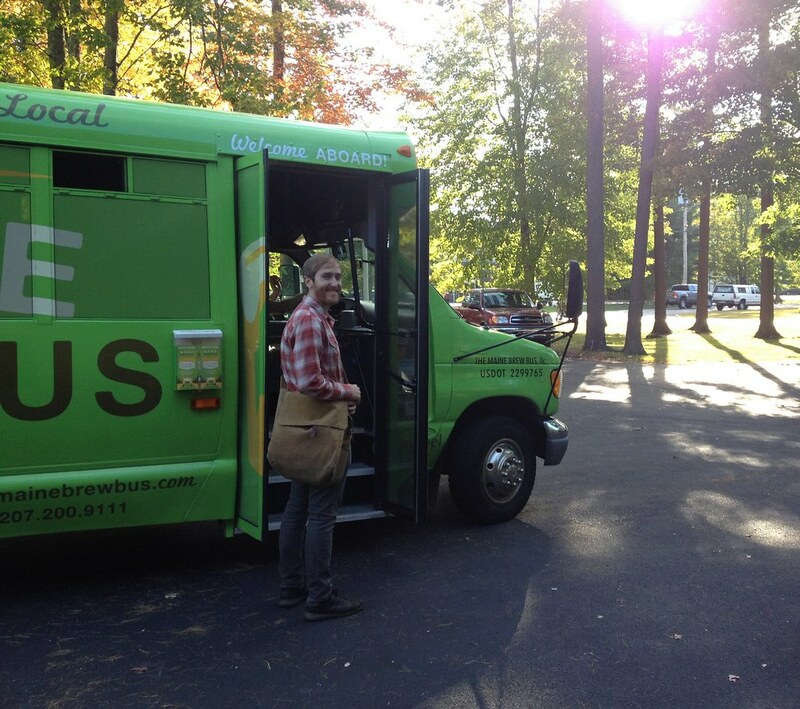 The Maine Brew Bus drove us back to the Great Lost Bear, another cornerstone of Portland's early craft beer scene. On the way, owner Zach Poole and VP of Operations Don Littlefield entertained us with the story of the Brew Bus' origins and tidbits about Maine's craft beer scene. 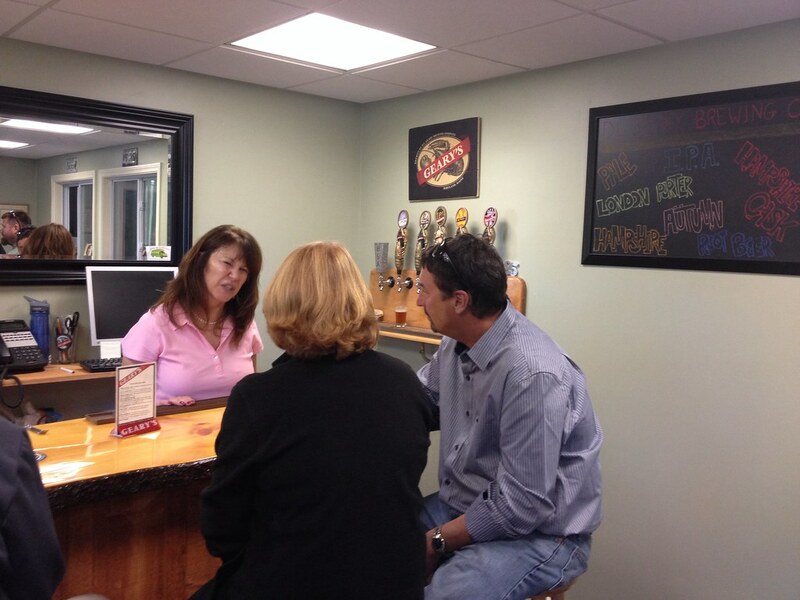 While I was only onboard for a total of 30 minutes or so, Zach and Don impressed me with their knowledge of both the beer-side and the business-side of the craft beer industry in Maine. The Brew Bus offers not only beer-themed tours, but features other exciting locally-made brews like craft spirits, kombucha, and mead. I'm looking forward to checking out a full Brew Bus tour soon - let's call it research for my second book! Similarly in the "showing off Portland" category is a recent meal I enjoyed at Eventide Oyster Co. Every time I eat there, the food and service solidify the place in my Top 10 Portland restaurants. I went for lunch with a journalist, who interviewed me for her upcoming book about what makes a place "home." I figured with all of the people I interviewed for my first book, I needed to return the favor by contributing to someone else's research! My connection to the food scene was obvious in thinking about what makes Portland my home. 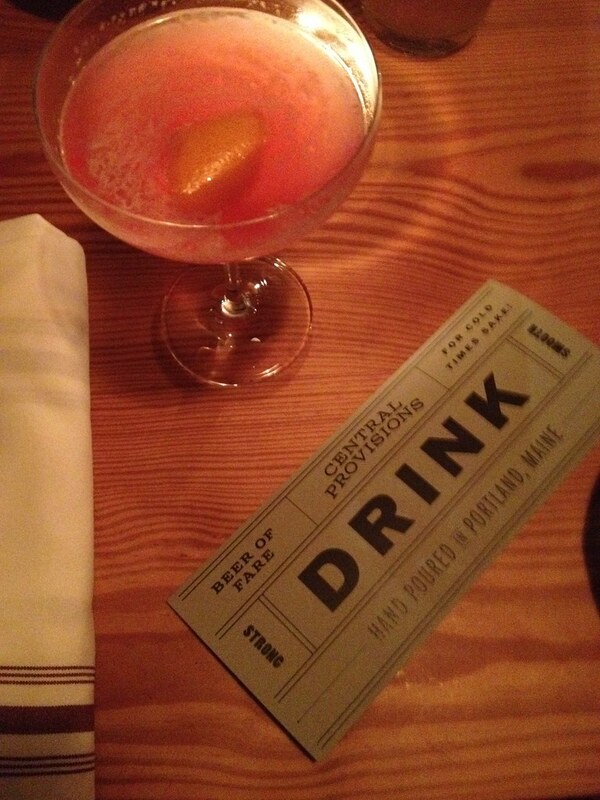 My love affair with Portland was ignited by the incredible food and drink scene I discovered upon moving here. And nowhere is that sense of place through food expressed better than at Eventide. Local this, local that; in tune with the seasons, the land, and the ocean...and of course, tasting great at every step. We sampled lobster rolls, lobster stew, the chickpea fries (mandatory), the arctic char special (pictured above), and the razor clam special. 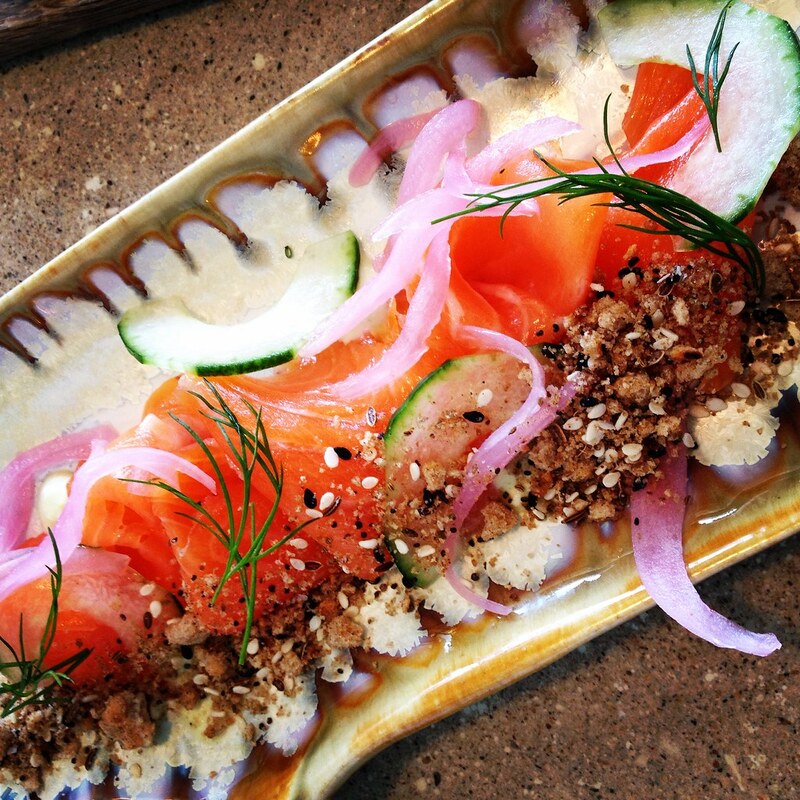 Thin slices of char gravlax came piled up next to cucumber slices, pickled red onions, dots of creme fraiche, and dill fronds. "Everything" crumbs (like the bagel flavor) sprinkled on top gave a nice crunch. 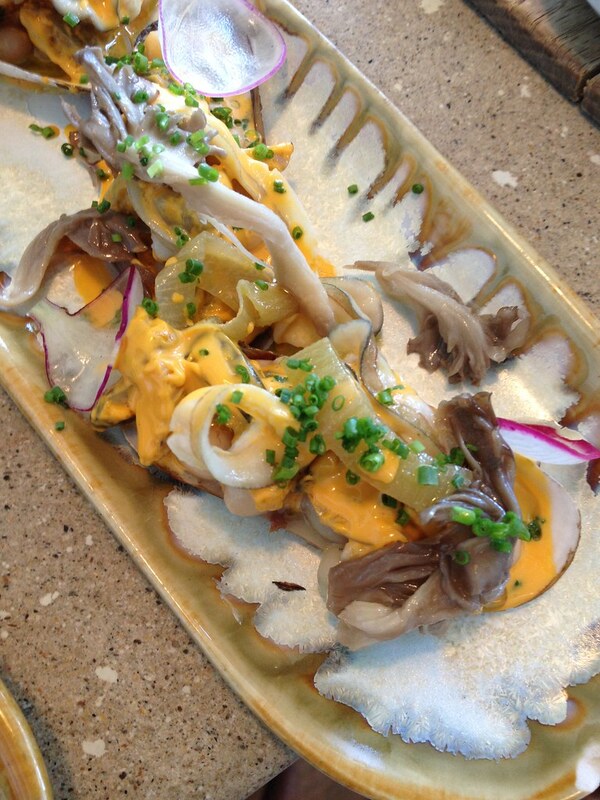 The razor clam special was another standout, with white beans and clams drizzled in a thin, slightly spicy orange sauce, and topped with pickled mushrooms, and thinly sliced radish. It was frankly not even something I thought sounded very appealing! But it was a great parade of textures and flavors, further proving one should trust in the great all-knowing chefs of Eventide. Farm fresh produce is overflowing at the farmers' market...but this is the time of year when it's here one week and gone the next. 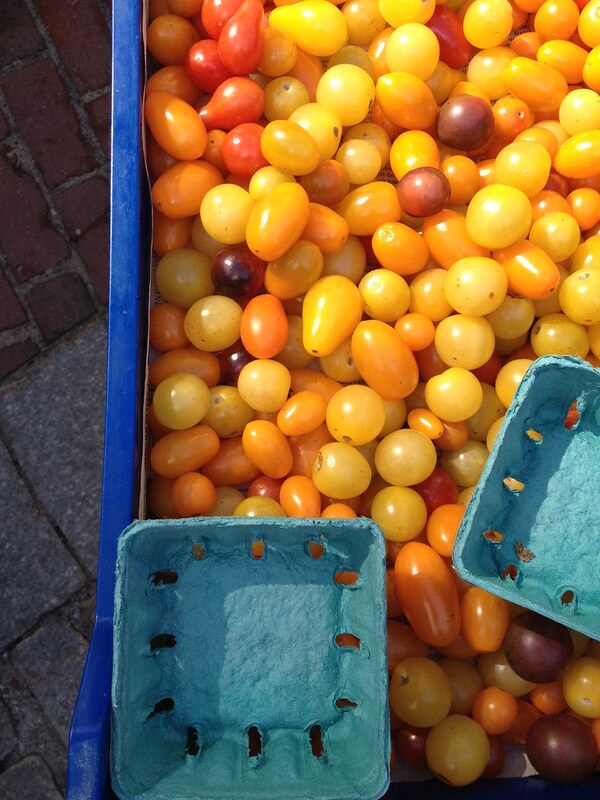 If you've got your eye on preserving anything or getting in one last gorging on a seasonal dear like tomatoes, sweet corn, or green beans, get to the Portland Farmers' Market ASAP - either tomorrow in Monument Square or Saturday in Deering Oaks Park. And speaking of seasonal dears, I made it to The Well at Jordan's Farm - I am nothing if not motivated by deadlines, as we eked out a dinner on the second to last night of service before the restaurant switches to weekday lunches. The Well at Jordan's Farm is a restaurant on the farm - Jordan's Farm in Cape Elizabeth. The kitchen is in a small shed-esque building, encompassing not much more than the kitchen line and the counter at which you order. Chef Jason Williams, formerly of the Back Bay Grill, approached farmer Penny Jordan a few years ago about starting a seasonal restaurant on the farm, using the farm's produce. Penny agreed and the restaurant has been a huge success ever since. Think Back Bay Grill quality food, but served in a picturesque Maine farm field. The evening's menu is written on a chalkboard sign as you approach the gazebo kitchen. We were able to choose a pork, fish, chicken, or vegetarian entrees and then just one salad, appetizer, and dessert option. Nice and simple. Our first round of food was delivered to us while we enjoyed the bottle of wine we brought (water, cups, and wine bottle openers are provided). We ordered several plates of the salad ($8) and lamb sausage appetizer ($8) to share. 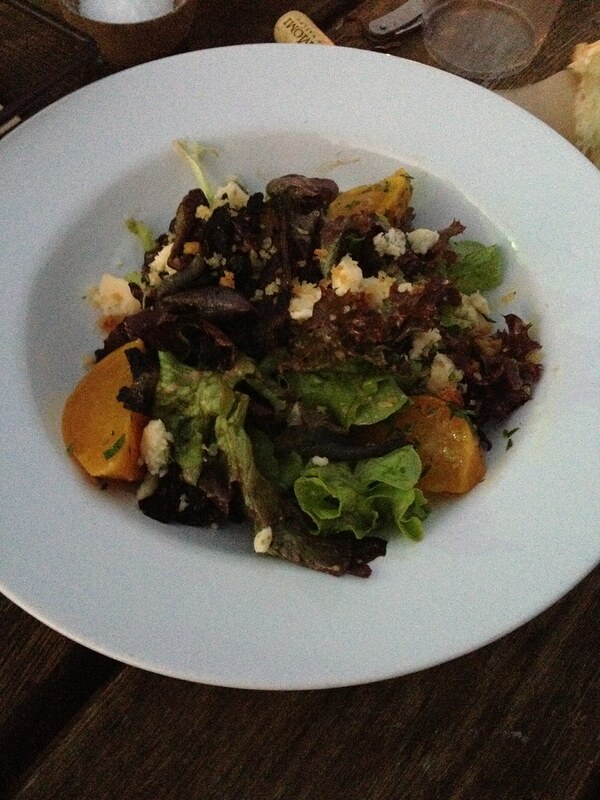 The salad greens were dressed with an aged balsamic vinegar with golden beets, Stilton cheese, grilled onions, and "crumb"tons or (crushed croutons). It was a fresh, simple salad that reminded me how delicious salads can be (I'd fallen out of love with salad greens over the summer). The lamb sausage appetizer was very juicy, perched on a piperade or a pile of thinly sliced peppers. While we waited for our entrees though, the sun began to set over the farm fields and the mosquitos descended. Our gracious server got the 5 of us set up in the gazebo-built-for-4 by squeezing in some stools so we all had a seat. Once enshrouded in mesh screening, we relaxed and enjoyed our meal once again. 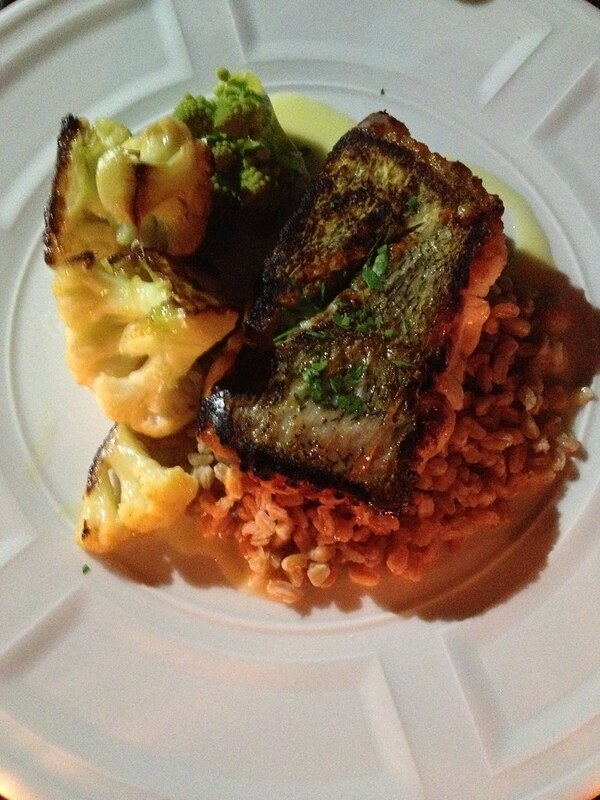 For my entree, I ordered the hake with a side of farro, roasted cauliflower and romanesco (cauliflower's fractalized cousin). The fish ($24) was also simply prepared, with tender flakes of fish filet held together by crispy skin. Elsewhere around the table, friends were declaring the chicken with squash puree, potatoes, and chard ($23) "the best I've ever had," and nibbling on strips of pork fat that accompanied the giant pork chop set over cranberry beans and braised red cabbage ($26). Everyone's plates were scraped clean, and we pushed back from the table, only to finish our glasses of wine and ponder how many apple compote donuts ($9) we were going to need to order (answer: 3). By 8pm, we were not the last people lingering outside under the darkening Fall sky, warmed by the glowing lights of the cozy restaurant kitchen. After admiring the clear night sky, in which the Milky Way was visible, we hopped in our cars and headed back to Portland. 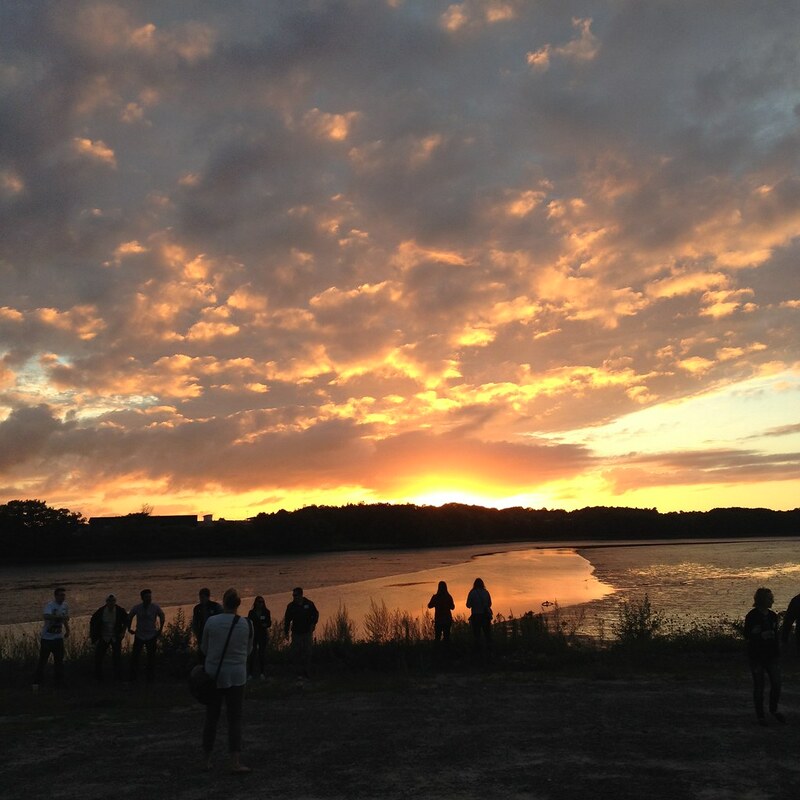 The Well at Jordan's Farm served its final dinner for the season last Saturday. But they'll be serving lunch on weekdays, starting October 1st (tomorrow! ), so it's not too late to try some of Chef Jason Williams and crew's simple, local fare. Be sure to grab a taste of summer's fleeting experiences before we settle fully into fall, whether it's via the farmers' market or directly on the farm at The Well. Twenty Ounce Pippin, huge pale-green monsters, as big as a baby’s head. Winter Banana, a beguiling yellow with a red blush. Black Oxford, diminutive purple-black orbs, dotted with light “stars.” American Golden Russets, a raised, sandpaper-y texture on its light brown surface. These aren’t far-off planets as envisioned by a science-fiction writer; rather, these unusual names and appearances describe heirloom apple varieties. As students trundle off to school, the nighttime temperatures begin to dip, and the daylight lessens, apple trees all across Maine are ripening. While we have come to think of apples as only “red” or “green” (and usually disappointingly mealy), local orchards are now offering apples with a plethora of tastes, textures, and uses. For those looking to learn more about the pedigree of the unusual and vast variety of forgotten apples, turn to Rowan Jacobsen’s new book, Apples of Uncommon Character: 123 Heirlooms, Modern Classics, and Little-Known Wonders. 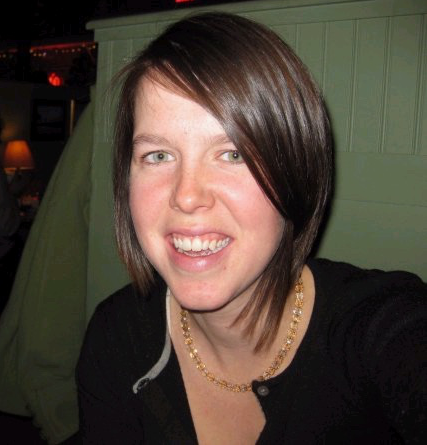 Jacobsen currently resides in Vermont, but is no stranger to Maine, exploring the terroir of bivalves in A Geography of Oysters and recently volunteering with NOAA researching the health of shellfish and puffins in the Gulf of Maine. In his latest work, Jacobsen presents an encyclopedia of apples, detailing rare and heirloom varieties, accompanied by beautiful color photographs. Become an apple aficionado through Jacobsen’s vignettes detailing rare and common apples’ history, as well as which apples are best for fresh eating, baking, saucing, and cider. The book’s final chapter provides apple recipes, from lobster Waldorf salad to classic tarte tatin. Jacobsen’s short introduction delves into the apple’s journey from Europe to the fledgling United States (including mention of John Chapman, aka Johnny Appleseed, and his entrepreneurial work adding value to plots of land by installing apple orchards) and then into the declining number of apple varieties available in today’s supermarket. Jacobsen also details the work of pomologists like Maine’s John Bunker, who hunts down rare apple varieties and preserves them in his Palermo orchard. Bunker and his wife Cammy Watts offer a 5-week apple CSA, providing share members with 55-60 pounds of apples, delivered every other week from mid-September until early December. The “Out on a Limb” CSA showcases about 30 different unusual apple varieties, from early-season tart specimens to end-of-season apples that sweeten in storage. Bunker will return to MOFGA’s Common Ground Fair again this year with his popular apple display. 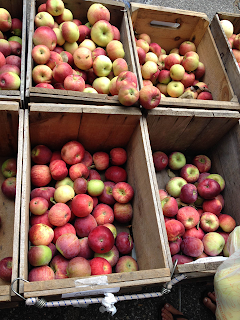 In southern Maine, apples have been quietly populating stands at the farmers’ market for about a month now. 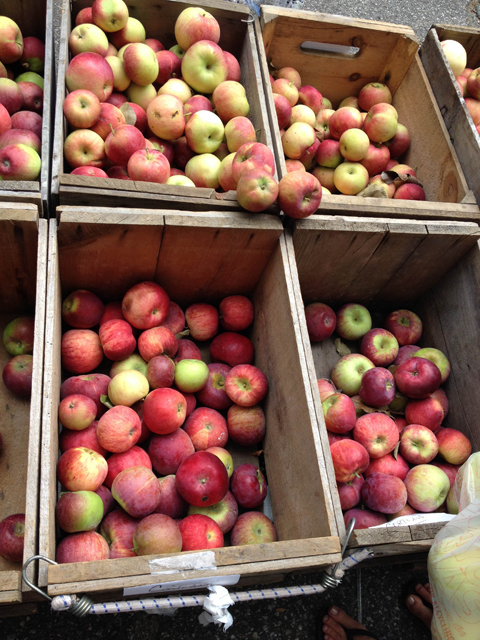 The first arrivals are what farmers call “Early Macs,” or McIntosh apples. This New England favorite is best early in the season, before the flesh takes on an unappealing mushiness. At Uncle’s Farm’s stand, farmer Mike Farwell is selling these Early Macs, plus Cortlands, Ginger Golds, and Paula Reds for $1.50/lb. Nearby Snell’s Farm is selling Sunrise Macs and Ginger Golds. All of these varieties are good for both fresh eating and baking, but do not store well like some other late-season varieties. My love for fresh, local tomatoes cannot be overstated. 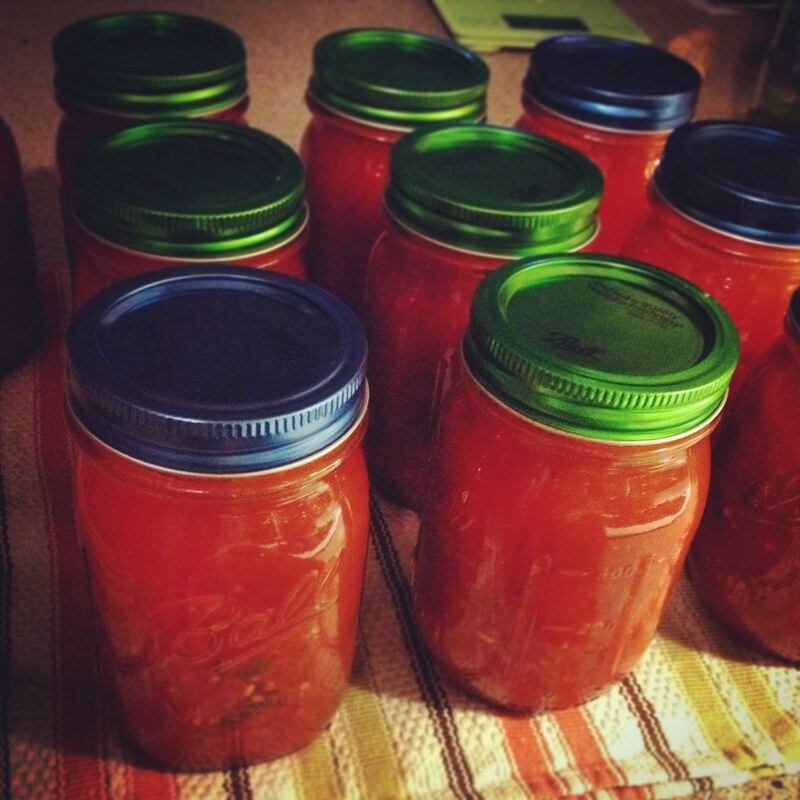 But (and I feel I'm making a bit of a canning confession here), I think preserving tomatoes in a way that captures their sweet, in-season taste can be a struggle. 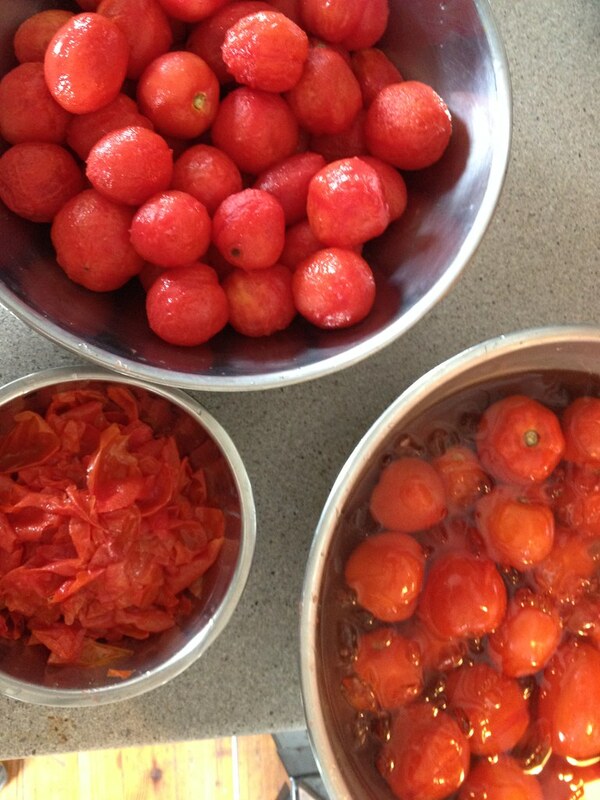 Preparing tomatoes for canning is always a process, no matter what method or recipe you use. 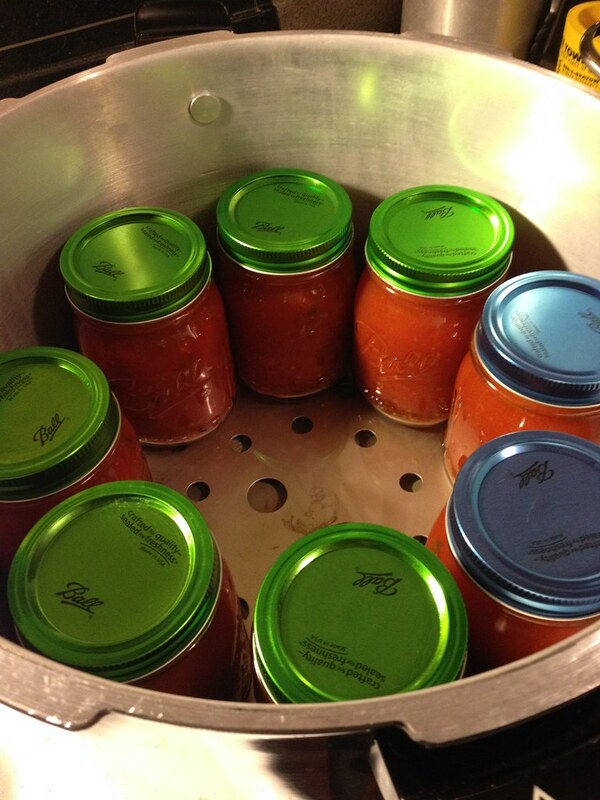 In years past, I've canned crushed tomatoes; whole, peeled tomatoes; and basil-garlic tomato sauce, all in a boiling water bath canner. This method requires the addition of bottled lemon juice for safety, which (as much as I've tried to convince myself it doesn't) imparts a tart flavor. 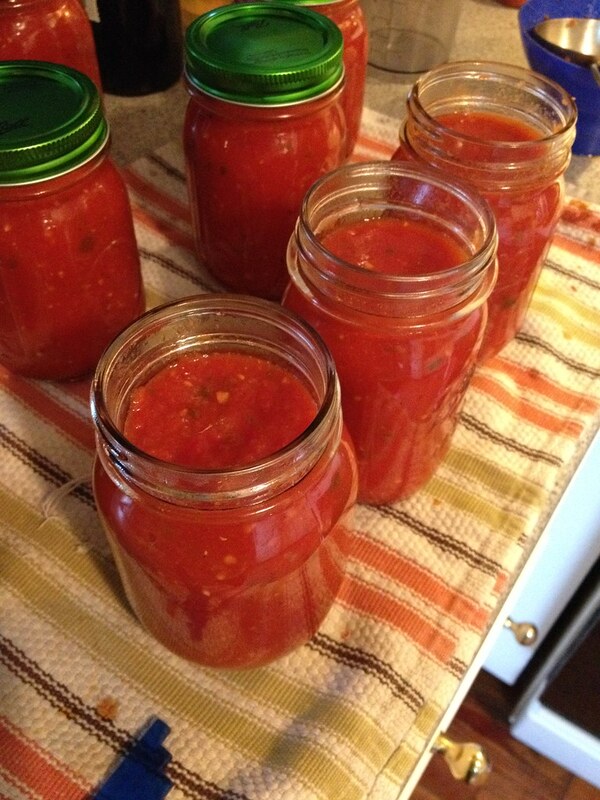 So if you're going to go all out - peeling tens of pounds of tomatoes, scooping hot tomatoes through a food mill, lots and lots (and lots) of dripping tomato juice - you'd better be sure that when you're finished, you have jars of something you're excited to use. So this year, I pressure canned spaghetti sauce. The peeling process is still necessary - or at least, I think it is. You don't have to peel your tomatoes (for safety reasons), but I prefer the resulting texture of a sauce made without tomato skins. So I score the non-stem end of all the tomatoes, drop them in boiling water (using a blanching insert in my stockpot helped hasten the process), and then cool them in an ice water bath. This took about an hour for a half-bushel of plum tomatoes (about 20 lbs.) from Fairwinds Farm in Topsham, Maine. Then, I made my spaghetti sauce: chopped tomatoes, sauteed garlic and onions in olive oil, and let it simmer for hours until it was reduced by about 1/3. The recipe suggests to reduce it by half, but I found my sauce was a desired consistency before that. At the end, I seasoned the sauce to taste, by adding a lot of salt, freshly-ground black pepper, a bit of sugar, and lots of fresh, chopped basil. The recipe calls for the addition of green peppers/celery or mushrooms, but I opted to leave all of those ingredients out. I filled 10 pint jars with the sauce and left an inch of headspace. 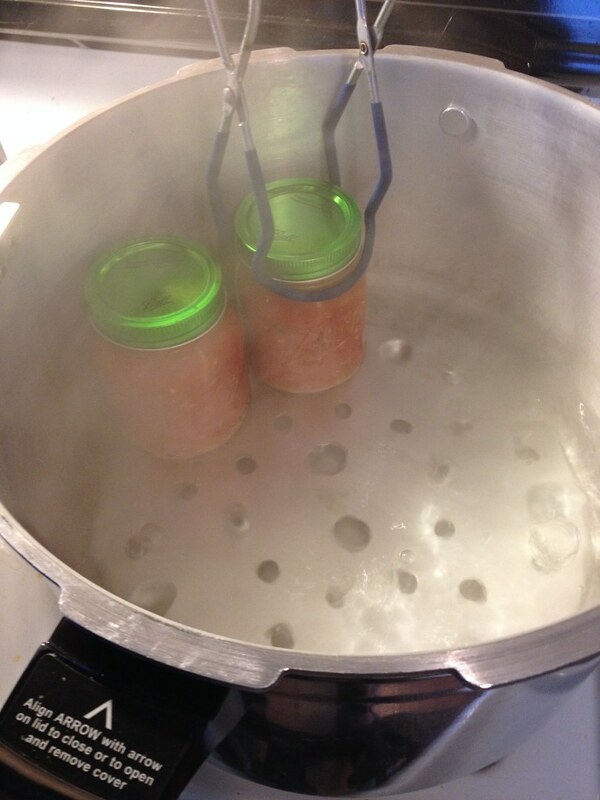 I screwed on my lids and bands and lifted my jars into the pressure canner, which was filled with 3 quarts of boiling water (I use a 16-quart Presto weighted gauge pressure canner/cooker, so I simply followed the instructions for how much water to add, how to operate, etc.). Once the canner was full (it holds 10 pints), I locked the lid on, and waited for the water inside to come to a vigorous boil. I vented the canner, by letting it fill with steam for 10 minutes (start a 10 minute timer when a strong V of steam comes out of the canner's vent pipe). This step is important, because it ensures the canner is full of steam, rather than steam and air, which will result in the proper internal temperature. I processed the spaghetti sauce for 20 minutes at 10 pounds of pressure (11 pounds if you're using a dial gauge canner). Pressure canning feels like a lot less hands-on work than boiling water bath canning. I don't think that's actually true, but after pressure canning, I was left with the very satisfying feeling that it was a lot easier than boiling water bath canning. After I removed them from the canner, the 10 pints of sauce sealed almost immediately, but I let them cool completely until the next evening before I labeled them and put them away. This spaghetti sauce recipe is great, because it doesn't require the addition of bottled lemon juice for safety. You can season your spaghetti sauce however you'd like; the addition of a few teaspoons of ground herbs and spices won't alter the pH significantly enough to become a safety concern. As always, do not change the quantities of food (tomatoes, garlic, onions, peppers/celery, and mushrooms) in this recipe or risk creating a product that might be unsafe for long term storage. Note that I left things out, rather than add more things in. Omitting low-acid ingredients is OK, but adding more is not. If any of that sounds like Greek to you, read up on how to preserve food safely using a pressure canner. I'm also teaching a pressure canning workshop through Scarborough Adult Ed. on October 23rd. Saute onions, garlic, celery or peppers, and mushrooms (if desired) in oil until tender. Combine sauteed vegetables and tomatoes and add remainder of spices, salt, and sugar. Bring to a boil. Simmer uncovered, until thick enough for serving. At this time the initial volume will have been reduced by nearly one-half. Stir frequently to avoid burning. Fill jars, leaving 1-inch headspace. Adjust lids and process at 10 pounds of pressure for 20 minutes (pints) or 25 minutes (quarts). 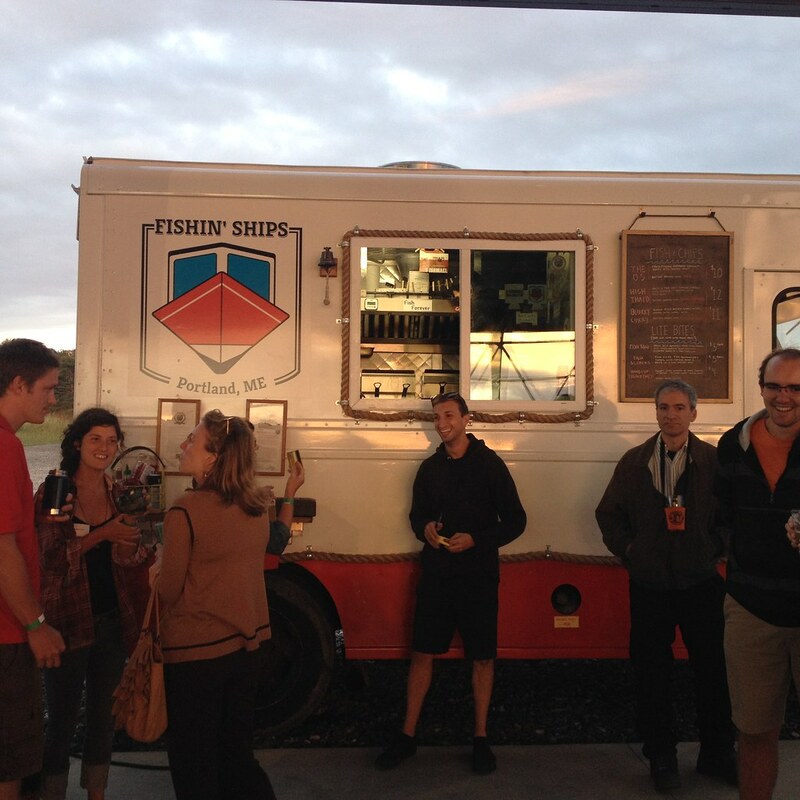 By far, the launch of the Fishin' Ships food truck was the one I was looking forward to the most. I followed the build-out of the truck on facebook, I counted down to their launch at Rising Tide Brewing Co. (and then was disappointed when it was delayed by a day), and promoted their appearances at Flea Bites food truck clusters on the First Friday of each month this summer. You'd never know, for all that, that I hadn't actually eaten from the locally-sourced fish and chips truck until last Tuesday night. Fishin' Ships, along with several other food trucks, was at Portland Greendrinks, the monthly environmental networking event, at Thompson's Point. While I sipped on a Sebago Bonfire Rye, I ordered up an O.G. 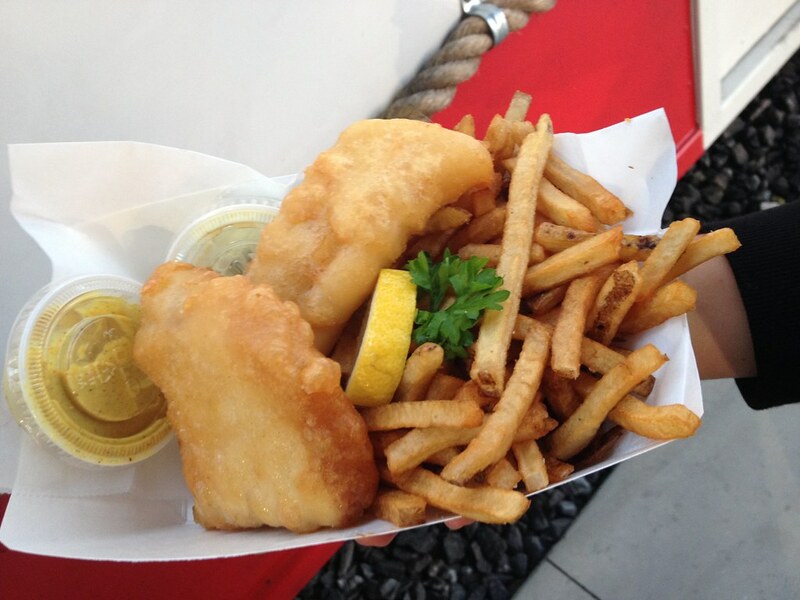 fish and chips ($10), described as "a classic preparation," on the truck's chalkboard menu. The hearty pieces of pollack were coated in a pleasing PBR batter and served with tartar sauce, plenty of fries, and a lemon. Because I've been chatting with the Fishin' Ships guys on twitter, they kindly kicked me over a fish taco to try as well. The fish taco ($5) also featured pollock, crusted in what they call their High Thai'd batter, a ginger, thai basil and chili-flavored batter, made with Bissell Brothers Substance Ale. 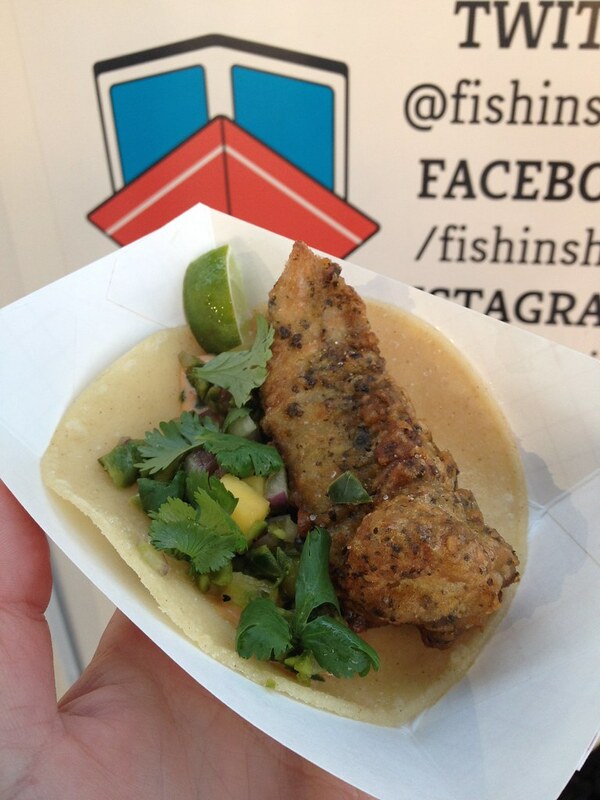 The fried fish is served in a corn tortilla and topped with a poblano-mango salsa, cilantro, and a spicy aioli. The O.G. preparation of the fish and chips was certainly good - crispy batter, flaky fish, not unpleasantly greasy, with crunchy fries - but the taco was my favorite. Next time, I'll explore the flavored batters and dipping sauces, as I'm more excited by the unusual flavors the rest of the fish and chips preparations have to offer. And about that fish: Fishin' Ships is a Gulf of Maine Research Institute Culinary Partner, which means they have pledged to always have a locally-caught and sustainable seafood option on their menu, are educated on sustainability issues surrounding the Gulf of Maine's fishing industry, and are working on increasing the overall environmental sustainability of their business. Pretty cool for a food truck. When the Fishin' Ships food truck first launched early this summer, I'd heard complaints from customers that the portion sizes were small and the prices high. I was satisfied with my portion of fish and chips for $10, and while my fish taco was on the larger size compared to other options in Portland, I would want to eat more of them than I could reasonably afford at $5 a pop. However, I trust that the guys behind the Fishin' Ships truck have set prices that allow them to use local ingredients while still eking out a profit. Perhaps Fishin' Ships sits at the intersection of the expectation that food from mobile vendors should be inexpensive and the fact that local and ethical food sources are not always the cheapest option. Follow Fishin' Ships on facebook, twitter, and Instagram to see where they'll be for lunch and dinner in the greater Portland area. Last week, I was on Maine Public Broadcasting Network's Maine Calling program, discussing preserving with two friends and fellow UMaine Extension Master Food Preservers. The three of us had a great time in the studio (despite that I was very nervous at first, natch) with host Jennifer Rooks. We discussed recommended methods for preserving, what to add to peach jam to make it delightfully spicy, the best recipes for beginners, and Laura's fermented Kosher dill pickles. And speaking of producing media...I'm writing another book! 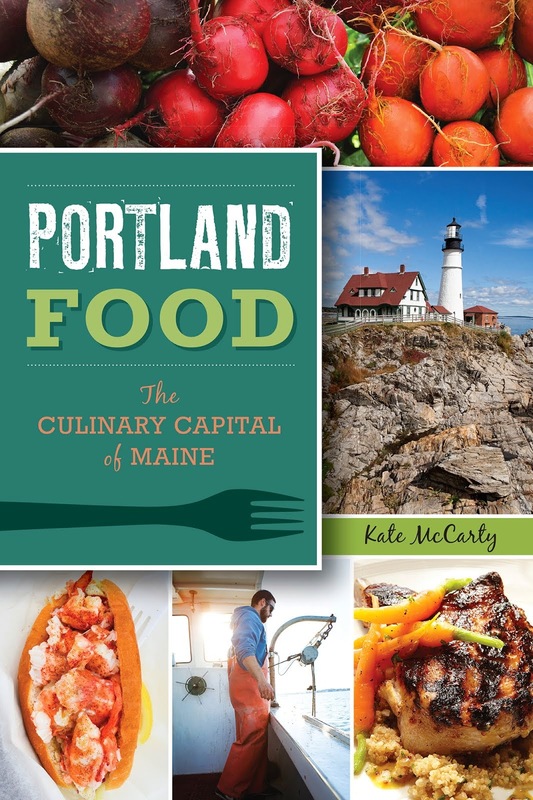 The History Press, publisher of my first book, Portland Food: the Culinary Capital of Maine, has commissioned me to write an account of the history of alcohol in Maine, due out September 2015. 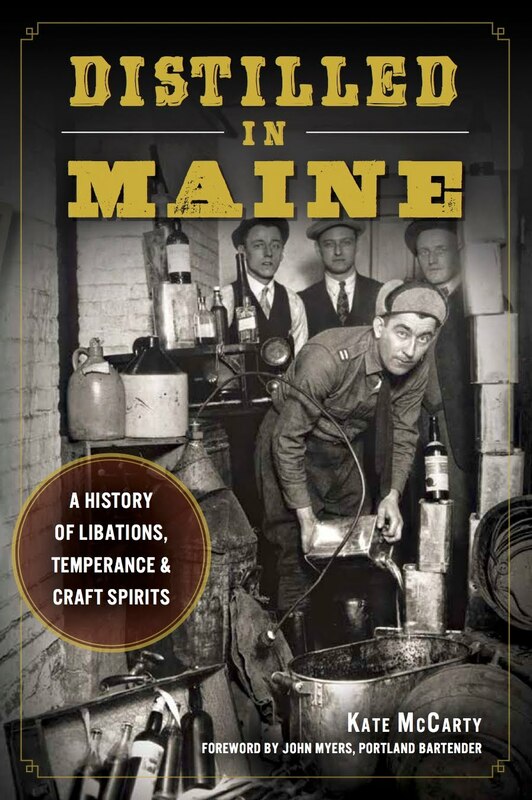 The working title is A Spirited History of Maine, and I'll cover Maine's complicated relationship with alcohol, from the nation's earliest prohibition in 1851 to the revival of craft distilleries and the farm-to-flask movement today. While the project will be different from Portland Food, in that it will be a more historical account than that of our fairly recently developed food scene, I'm excited to interview Maine distillers, craft cocktail bar owners, bartenders, and historians. If you feel you've got something to add, be it an idea, a person to interview, or a resource for me, I'd love to hear from you! Please leave a comment or email me at blueberryfiles@gmail.com. Cheers! I'm looking forward to all of the "research" that will go into writing A Spirited History of Maine.